The film genre of mystery drama by definition places some of its elements under cover, and that was the tone the people behind “Burning” sought to achieve. Jong-soo, a part-time worker at a delivery company, meets Ben through his childhood friend Hyemi -- played respectively by Steven Yeun and Jeon Jong-seo -- and stumbles upon a mysterious incident. “This film was particularly hard for me” he said, adding that he attempted to represent the younger generation in his own way. Yeun, popular for playing Glen Rhee in the TV series “The Walking Dead,” said it was “very lucky” for him to work with Lee, although having to speak Korean was tough for the Korean-American. Performing alongside two veteran actors is a little known actress Jeon Jong-seo, for whom “Burning” is her first mainstream movie appearance. “She has so much potential that I cannot wonder what she’s been doing so far, to appear before me just now,” said Lee, adding that he was sure that Jeon was an actress “never before seen in Korean cinema. Describing the young actress as a raw potential, he said that her unpredictable nature made her sure that she was the only person for the job. He added that he did not want to control the young actors too much, as it is a film about the young generation. “Preferably I wanted the film to feel like it is making itself, that we are all taking part in making it, rather than it being made through a specific goal and outside intervention. I wanted everyone to speak out their thoughts,” he said. The film was selected to compete for Palme d’Or at the 2018 Cannes Film Festival, the only Korean film this year in the running. 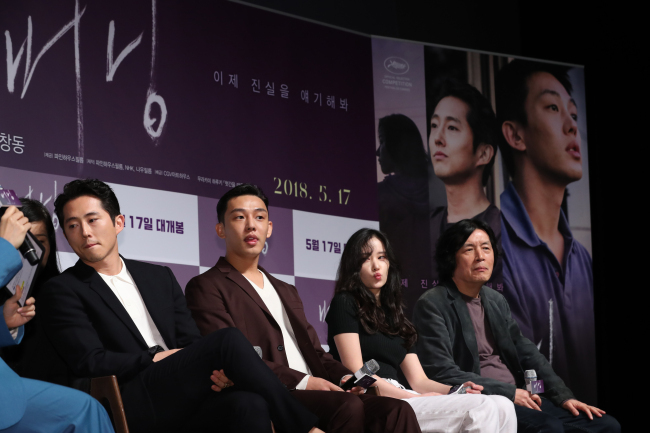 “(Being at) Cannes festival is an effective way to promote Korean film and be assessed, and I think it is the best opportunity for these three actors to be known to the global audience and be evaluated,” Lee said, on his fifth film to be screened at Cannes that will be held from May 8 to 19 in the southern coastal French city. Yeun visited Cannes last year with Bong Joon-ho’s “Okja,” but he said it was more special this time as the film shows the audience something that they have not seen before. The press conference may have sparked more questions instead of answers, but the combination of sheer talent is generating anticipation from local movie-goers. The film, based on “Barn Burning” by best-selling Japanese author Haruki Murakami, is set for release in local theaters on May 17.